Chemical computers can exploit several different kinds of reaction to carry out the computation. For example, so-called conformation computers use polymer molecules that change shape in response to a particular input. Metabolic computing exploits the kinds of reactions typically found inside a living cell. Dr Andrew Adamatzky of the University of West England works on another type. "I am dealing only with reaction-diffusion computing," he explains. This type of computation exploits waves travelling through a beaker of chemicals to carry out useful calculations. These waves are the information carriers in the computer. 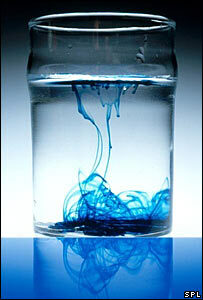 They are created by triggering chemical reactions in the soup at specific points. As waves propagate from different areas they collide and interact - effectively processing the information they hold. At the site of their interaction a point with a new chemical concentration is created, which is in effect an answer. With a beaker full of thousands of waves travelling and interacting with each other, complex computational problems can be solved. Although the process sounds complicated and esoteric it can be applied to almost all computational problems. "Reaction-diffusion processors are universal computers, they can solve all types of problems," said Dr Adamatzky. As a result, computer giant IBM is already interested in the technology. Although slower than silicon, its key advantage is that it is cheap to produce and incredibly robust. Working with chemist Ben De Lacy Costello, Dr Adamatzky has already produced logic gates using the technique that can be used to make chemical "circuitry". "Ultimately, we will produce a general purpose chemical chip," he said. The chip would be capable of mathematical operations such as adding and multiplying numbers, he said. However, he believes he can take the research even further to create intelligent, amorphous robots. "Assume we have fabricated an artificial amoeba, gel-based robot, without any fixed shape, and capable for splitting into several smaller robots," he said. "Conventional silicon circuits will not work because they have rigid architecture." But as chemical computers are an amorphous blob they could be cut in half and both would continue functioning independently. "You can not cut your laptop in half and expect both parts to function properly; you can do this with reaction-diffusion processors," he said.